Preheat the oven to 350 degrees. In a large bowl, mix the brown sugar, white sugar, shortening, eggs, and vanilla with electric mixers on low speed until well mixed. Add the 2½ cups flour, baking soda, and salt. Mix until just combined; I found it easiest to finish this by hand. Add the extra tablespoons of flour until the dough feels thick and almost dry to the touch. 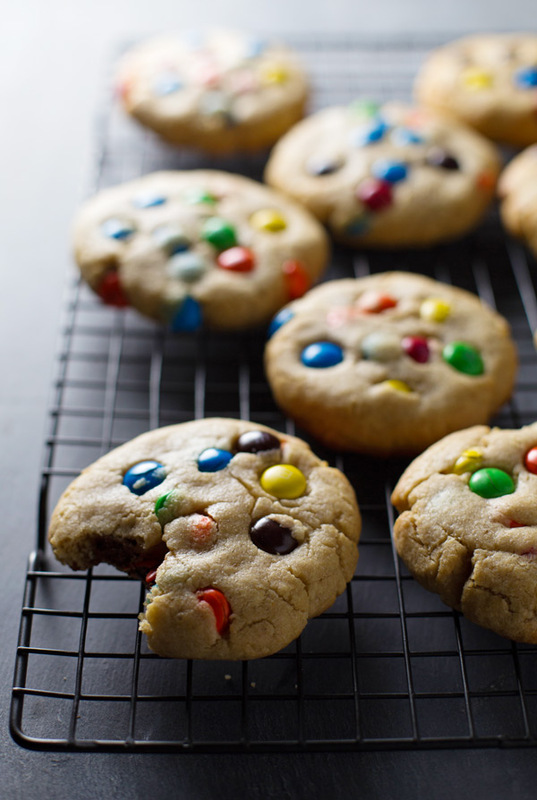 Stir the M&M's into the dough. Roll into large balls (unless you want small cookies, and who are you anyways?) and press extra M&M's into the tops. Flatten slightly with your palm or the back of a wooden spoon. Bake for 8-10 minutes (they will be slightly underbaked). Remove from cookie sheet right away and place on cooling rack. Let stand for 5-10 minutes to help the cookies hold their shape. I always put a little extra flour in my cookies so they don't get flat. But if you find that you get too much flour and they aren't flattening at all (I may or may not have made this mistake) just press them down with the palm of your hand or the back of a wooden spoon so they are normal-cookie-shaped before you even bake them.